NOTICE: This digital format is an ePUB meant for tablets OR for use on computers using a free ePub reader such as Adobe Digital Editions. INSTRUCTIONS: Register with this site prior to purchase of any ePub. A guest registration will not allow return access to a purchase. Three separate attempts for download only. FOR CLASSROOM USE, PLEASE ALSO PURCHASE THE CLASSROOM LICENSE. This student reader, A Compact History of Humankind: The History of the World in Big Eras is written with an middle school/early high school student in mind (Grades 6-10). 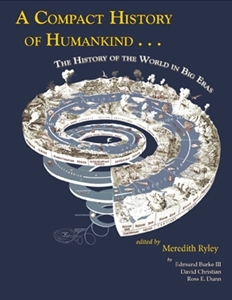 By revising essays written in World History for Us All (a web-based model curriculum for world history available online at http://worldhistoryforusall.sdsu.edu), the editor, Meredith Ryley, has adapted this very short history of the world by using language and ideas accessible for younger students. By using “Big Eras,” these students can think about the human past on a broad scale using the periodization framework and the basic organizational structure of the World History for Us All curriculum. This text is an interpretive narrative of the human past from the origins of the universe through the twentieth century. Each of the essays is organized in three primary sections: Humans and the Environment, Humans and Other Humans, and Humans and Ideas.